This board comes in a standard 16-snippet sound version. Once your droid hears a voice or sound, he will respond by stitching together random sound snippets to make up a droid sentence! You will get different sentence structures and lengths each time, and they are never the same (even when powering the circuit on and off)! The sound board can store more sound snippets, so you have the potential for less repetition of phrases. It also has a reminder feature. If you do not talk to your droid for 5 minutes and the circuit is still on, he will make a special sound for you! If you still do not respond after another minute, your droid will make a second sound. This is to remind you that he is still active. The sound board has two trigger inputs. The VOX board is connected to the first input. The second trigger input is unconnected and can be used to trigger the droid sounds using a secondary sensor, i.e. 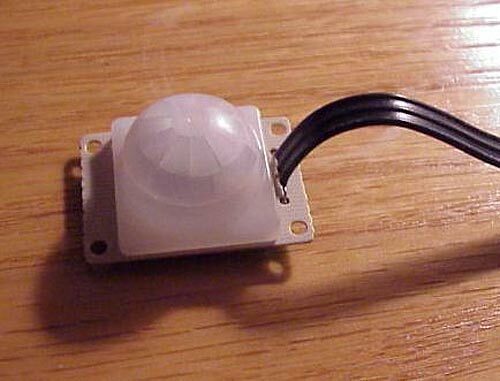 a compatible motion sensor or RC control relay. 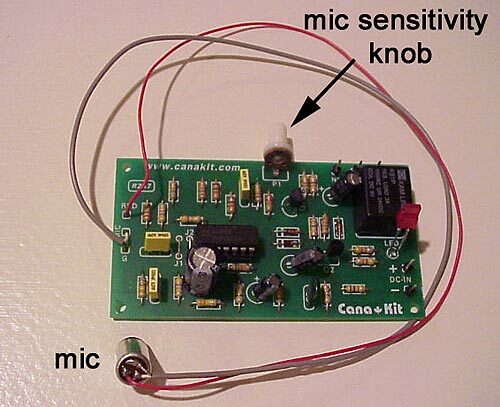 The sound package comes with assembled voice-activated PC board and mic (with a mic sensitivity knob), an assembled sound board, a small speaker (wired up), and a power switch. The board runs off a 6AA battery pack or 9V alkaline battery. You can also use any other battery source in the range of 6-12V. You can put whatever sound snippets you wish on the sound board. You can now use our heat-sensing motion sensor with the droid sound board, so your droid will talk non stop when somebody approaches him! Good for warnings or just playing with the kids! 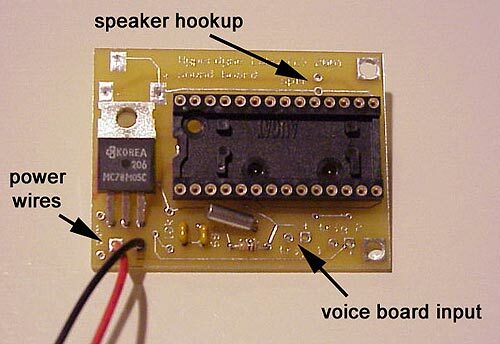 For the 16-snippet sound board, you can hook the motion sensor up to the secondary trigger input (with the IR droid board), so now your droid will respond to movement and voice! There is an added cost for the motion sensor, and it can be purchased separately. See the pricing page for more info.